A health facility with emergency care will open in Greenwich Village after a deal was struck among Saint Vincent Catholic Medical Centers, the North Shore-LIJ Health System and the Rudin family. Plans call for a neighborhood medical complex as part of a proposed redevelopment project, the organizations announced March 10, 2011, according to an article at crainsnewyork.com by Barbara Benson. "St. Vincent's is seeking court approval to sell its most significant real estate asset, the Manhattan campus, for $260 million to the Rudin family. But it will transfer the O'Toole Building to North Shore-LIJ, which will invest $110 million in a project to create a comprehensive health care center there with a freestanding emergency department. The facility is expected to treat more than 72,000 patients annually and employ 300 people. The O'Toole Building is located on the west side of Seventh Avenue between West 12th and West 13th streets. North Shore-LIJ plans to invest $110 million to renovate and develop the building to create the North Shore-LIJ Center for Comprehensive Care. The Rudin family is providing $10 million to partially offset North Shore-LIJ's costs," the article said. "The proposed center would provide round-the-clock emergency care," the article said, adding that "if approvals are granted, it would open in the fall of 2013. North Shore-LIJ said in the announcement that the facility would be the first freestanding, 24-hour emergency department in the New York area. It would feature a diagnostic imaging center with digital x-ray, computed tomography, magnetic resonance imaging and ultrasound services. There also would be a specialized ambulatory surgery facility to focus on interventional treatments for the sick and elderly. 'The Center for Comprehensive Care proposal is an innovative solution to the health care dilemma facing residents of Greenwich Village and other local neighborhoods, who have been without a nearby emergency room and other critical health care services since the closure of St. Vincent's Hospital,' said Michael Dowling, North Shore-LIJ's president and chief executive, in a statement. 'Making this facility a reality, however, will require city, state and federal approvals, all of which are needed for us to move forward with this project,' he added. North Shore-LIJ opened an Urgent Care Center on Tuesday at 121A W. 20th St. and is exploring other proposals to strengthen health care access in lower Manhattan. St. Vincent's said its board of trustees and creditors approved the deal, which will be brought before the bankruptcy court at a hearing to approve the sale on April 7. In 2007, the Rudins had entered into a contract to develop the hospitals properties on the east side of Seventh Avenue between 11th and 12th Streets for $300 million so that the hospital could demolish the low-rise O'Toole Center on the west side of the avenue into a new hospital with a curbed setback tower on a rectangular base. "The original Rudin contract and all previous proposals involving the Manhattan campus were contingent on obtaining zoning approval," the article said, 'so SVCMC pursued an amended transaction with Rudin, which had made extensive progress in navigating its plans 'through the uncertain, often contested and costly zoning, landmark and community approval process,' the hospital wrote in court papers, concluding the Rudin group had the best chance at completing a transaction." The deal for a new medical facility is linked to a Rudin family residential development on West 12th Street between Sixth and Seventh avenues, previously approved by the NYC Landmarks Preservation Commission. That project includes about 300 apartments and five brownstones. It would reuse four buildings that were part of the St. Vincent's campus. The project meets previous Landmarks decisions by preserving five key buildings: O'Toole, Spellman, Smith, Raskob and Nurses'. The proposed sale includes lots, pieces or parcels of land located at 1 Seventh Ave., 133 W. 11th St., 143 W. 11th St., 148 W. 12th St., 158 W. 12th St., 170 W. 12th St. (collectively referred to as the East Campus); 76 Greenwich Ave. (the Triangle Site); and 20 Seventh Ave. (the O'Toole Building), the article said, adding that "the Rudin family said in the announcement that its project team would work with the local community and elected officials to design new park space at the St. Vincent's triangle. A new 564-seat elementary school at the Foundling Hospital at West 17th Street and Sixth Avenue is also proposed. The Rudin family said it will build the park on the triangle, in addition to providing financial backing for the new elementary school." The Edward & Theresa O'Toole Building was originally erected for the National Maritime Union in 1964 and was designed by Albert Ledner and was notable for its nautical motifs. 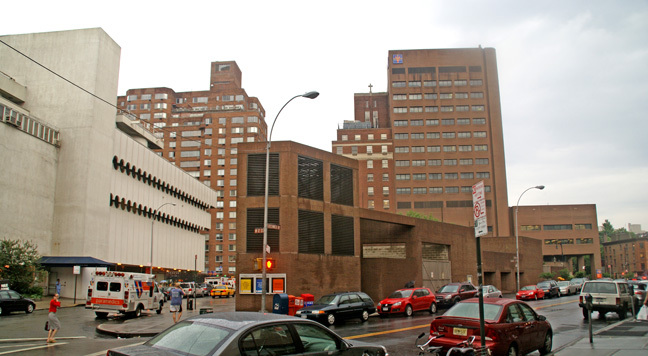 The plan to demolish it plan met with considerable opposition from nearby residents and some preservationists and only when the hospital filed a "hardship" application did it get approval from the Landmarks Preservation Commission. The new proposed hospital tower designed by Pei Cobb Freed Architects on the O'Toole site was eventually reduced in the final approval by the landmarks commission about 40 feet in height to 286 feet and the tallest residential building designed by the Rudins by FXFowle was also lowered in height. The announcement that agreement had been reached on a new plan was stunning news as the preservation controversy over the site's development was one of the most heated in the city's history and greatly complicated not only by the debate over the architectural merits of the O'Toole building but also by the recession and the need for a major medical facility to serve Greenwich Village and Lower Manhattan. If approved, it is a great testament to the steadfast dedication of the Rudin family to persevere and come to the aid of the hospital.